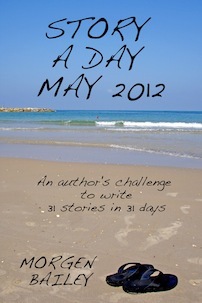 Late April 2011 I discovered StoryADay.org and the project that is to write 31 stories in 31 days. Anyone who knows me or follows this blog, knows how passionate I am about short stories so my clichéd eyes lit up at this new marvel. And just a few days later there I was, breathing life into new characters. This went on to become (after editing of course) my 31-story collection eBook Story A Day May 2011. I am delighted to announce (July 2013) that the 2012 collection is now available (only a year and a bit late!) and is available exclusively from Amazon.com, Amazon.co.uk (and other Amazon countries). An English Summer (496 words). You Are A Lovely Lot (286 words). What He Saw (574 words). It’s Not Every Day (284 words). Two Out Of Three (386 words). I Did My Very Best To Die In The War (333 words). The Dancing Stopped in 1983 (349 words). Charity Shops on Saturday (548 words). The Photographer That No-One Else Can Get (594 words). White Chocolate Chocolate (318 words). Just A Figure Of Speech (640 words). Would Chuck Chuck? (187 words). Don’t Talk To The Food (620 words). Some Shoes To Match (345 words). 1966 And All That (100 words). The Legends of Louisiana (107 words). Bill The Bag Man (726 words). The Quest For The Truth (215 words). I Always Did Hate Biology (380 words). The Best Man (308 words). The Perfect Place (108 words). One Out Of Three (595 words). Stronger Than He Looks (421 words). Not Like They Used To (301 words). Thank You For The Joy (345 words). In His Shoes (974 words). Sabbatical From The Rat Race (630 words).